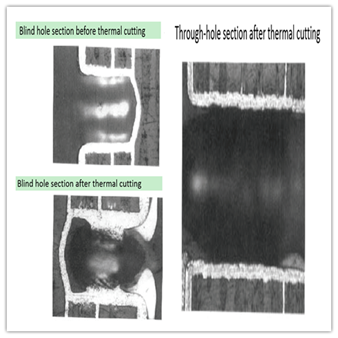 Mechanical blind through-hole PCB means that both the blind holes and the through-hole of the plate are formed by the process of mechanical drilling. For example, the figure below is the schematic diagram of a kind of mechanical blind through-hole PCB. Compared with the original process, the new process reduces 5 processes, and relatively speaking, the new process saves time cost and manufacturing cost. In general, the depth on the z-axis of a drilling rig is generally controlled by servo motor, and its depth reference point is calculated from the table, and the accuracy tolerance can only reach about 0.05 mm. If the mechanical drilling machine is used to drill the blind hole, the depth tolerance of the blind hole is greatly affected by the thickness of PCB. In addition, there are many cases where the dielectric layer between layers is as small as 0.1mm, so the drilling depth tolerance is only about 0.05mm, which is also difficult to bear. Thus, it can only be used in cases where the dielectric layer between layers is relatively thick and customers have not strict requirements on the depth tolerance. Before drilling, the drilling depth must be set in the drilling program according to the actual drilling depth, and the first PCB can be made for verification. As the drilling depth of the current mechanical drilling is generally between 0.3-0.4 mm, the drilling pollution is less after drilling, but the mechanical blind hole is generally through the 3-4 layers of the line, in other words, the drilling pollution of the annular ring in the inner layer will seriously affect the reliability of the finished product, so in Desmear need to pay attention to. It is suggested that horizontal Desmear should be used to extend the treatment time appropriately and strengthen the oscillation, so as to avoid that there are microbubbles in the blind holes and the potion cannot be changed. The A.R. ratio of mechanical blind holes is basically 1.2 : 1. It is recommended to use horizontal PTH electroplating line to ensure the exchange of liquid in the blind holes and avoid the generation of microbubbles. If the vertical production line is used, the oscillation should be strengthened and the current density should be appropriately reduced and the plating time should be prolonged to ensure that the bottom of the blind hole can be plated with copper normally. The mechanical blind hole can achieve the better coating uniformity by adjusting the positive and negative current ratio of PTH and the condition of pattern electroplating.